Into the Void is a popular perfume by Juliette Has A Gun for women and men and was released in 2016. The scent is woody-floral. Projection and longevity are above-average. It is still in production. Hm, it's been a long time since I tested a Juliette fragrance, especially one of those more exclusive fragrances that come in other flacons. Maybe that's because I'm a little afraid of the scratchy Juliette, who is supposed to be armed (... I hope only with flacons... although they can hurt a lot if the Furie throws them against your head!!). Nah,... to tell you the truth, I just lost interest in the Juliettes for a while, because I've been meeting a freaky perfuma in perfumeries lately (oh yeah, you reading this, you know I mean you, mu ha ha ha!!!) D), which dragged me into niche perfumeries rather than testing such fragrances, and where I feel somehow lost or better said overwhelmed every time, because I don't really know most of the niche fragrances and I should really be more involved with these fragrances. But that's another story, so now I'm back to this Juliette here. 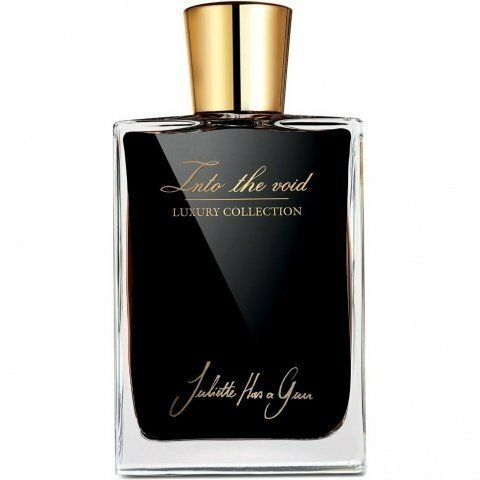 The name of the fragrance means "into the void", which sounds a little mysterious, which of course always increases the tension on a fragrance, you won't find also? Ah, licorice! You immediately smell this black candy that you either like or just loathe. For my part, I like many kinds of sweets, including liquorice. Well, as a fragrance it is a little unusual, but not necessarily bad. In addition, there are softer scents, which must be the powdery tonka bean from which the nice sweet note emanates. Then I smell the woods from which I can best smell out the softer guaiac wood. I've also noticed some oud streaks. Not too strong, not too weak, just good and appropriately dosed. Okay, now I'm having trouble smelling the black orchid out because I don't know its scent that well. There's something heavy flowery, but not dry sticky. It is difficult to describe, because the flowery note does not smell stronger and thus more striking than the other scents like the tonka bean or the woods, but maybe it will come in the further course of the scent. Later I find the Oud better smellable and am now also sure that Oud is in it, even if it was not specified now. The powdery tonka bean still smells deliciously delicious with its gentle sweetness, the floral notes (and also the liquorice), on the other hand, are slightly diminished, so it seems that the orchids do not become stronger after all. The woods form the basis of the base, from which the cedar can now also be seen very clearly. In the later base the fragrance is still lightly powdery, soft and sweetish due to the tonka bean (the sweetness also reminds a little of amber), but the cedar radiates most intensely now, in addition you continue to smell a little oud (and this somehow mixed with some earthy patchouli). The Sillage is quite good and therefore very good at a smellable. Applied generously, it can even fill a room for a while. Also the durability is quite good. You can smell the scent from morning to night. The bottle is rectangular and has a black tint from the inside (or the scent liquid is dark, so that the bottle appears tinted, I don't know exactly, because I didn't have this scent or the bottle in my hand). On the front you can see the name and the brand in beautiful golden letters. Also the lid has been gold-plated, so that everything looks very high-quality, but not ostentatious. A somewhat simple looking, but nevertheless nicely made bottle. Soo, uh, yeah, I think the scent's pretty good. It is a soft, but sillage-like yet intense scent, which smells quite great of woods, powdery-sweet notes and flowers. The flowery notes are rather small and therefore not very feminine, so that the fragrance could be worn by men if you like softer and gentler fragrances. The fragrance is a type of fragrance for autumn and winter. I think it can be used as an all-rounder, by which I mean that it fits well both during the day and in the evening and for going out. Yes, I think the scent is very nice or beautiful, and if you like soft scents, you should try this scent. An OK perfume, quite likeable when the licorice shows up. It has a slight similarity with Bvlgari's Jasmin Noir L' Essence, which I already own and definitely prefer over Into The Void. L'Essence has no patchouli and no papyrus (which does Into The Void no good, it makes it too impervious). Instead we have jasmin, almond, myrrhe and LOTS of tonka, creating a more wafty, creamy and deep perfume. ITV has that typical JHAG vibe (clean patchouli), especially in the drydown, which makes it rather un-unique.